IITA and ICRAF scientists active in the cocoa sector met on 23 March, in Yaoundé for a strategic consultation workshop. The objectives of the meeting were to (1) better understand the various skill sets at IITA and ICRAF that are relevant for the Congo basin, (2) identify a priority set of ideas that cut across those skill sets for translation into projects or proposals, (3) develop strategies to integrate agroforestry into agricultural practices through upcoming initiatives, and (4) explore the cooperation around perennials, the intensification for conservation using existing available resources between the CGIAR Research Program on Forests, Trees and Agroforestry (FTA) and the CRP on Climate Change, Agriculture and Food Security (CCAFS). 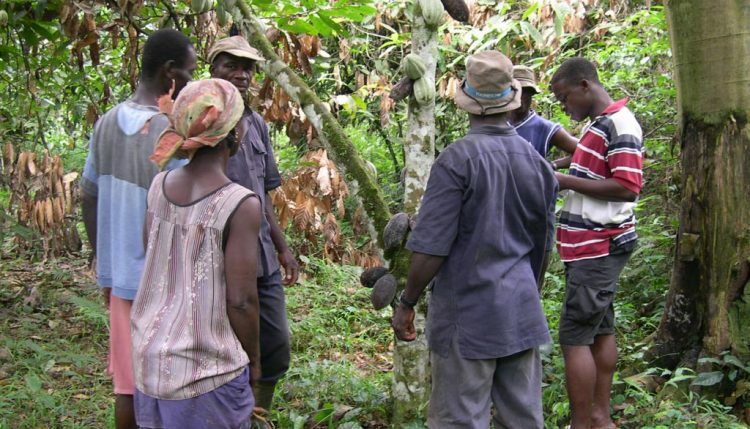 Researchers and cocoa farmers discussing ways of protecting cocoa plants from stresses. The two institutions were led respectively by IITA Central Africa Hub Director Bernard Vanlauwe and ICRAF Deputy Director General for Research Ravi Prabhu. Participants learned about recent developments in the two institutions with presentations by ICRAF Regional Director Zack Tchoundjeu and Vanlauwe. 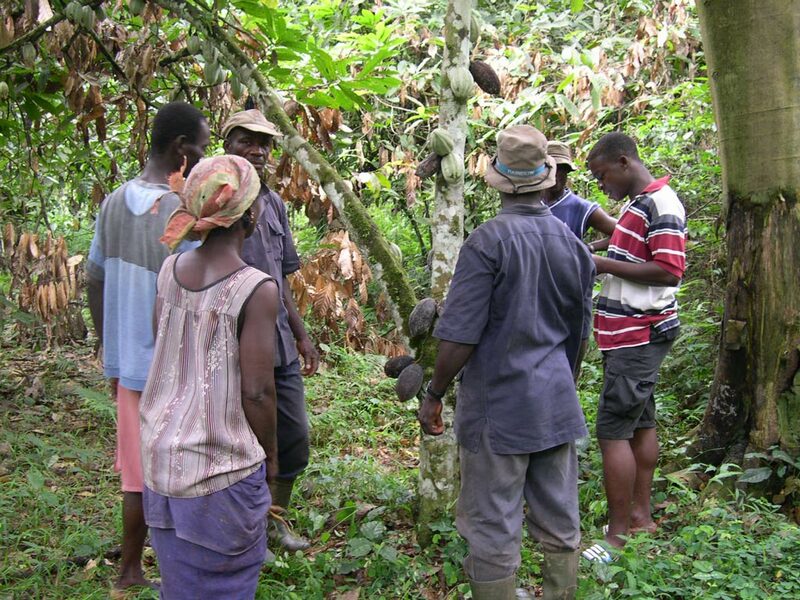 Some common areas were identified: cocoa and other tree crops, intensification pathways, Redd+, market and institutions, entrepreneurship, and youth and IPM. A series of cocoa technical guides on IITA know-how was presented. Three groups were formed to reflect on sustainable intensification pathways, cocoa and three other crops, and Redd+. Plenary sessions identified some action points including a one-day workshop that could be organized in DR Congo to partner with FAO and the valley rehabilitation project in Burundi through which IITA and ICRAF could demonstrate how to successfully combine trees and crops, and generate incentives. The meeting was attended by 10 researchers from ICRAF and 7 from IITA.